“Self-leveling underlayment” is a bit of a misnomer. Although this type of product is incredibly useful, it does require a thoughtful installer to ensure it works properly. Follow this guide to prevent cracks in your self leveling underlayment. 1. Select a product appropriate for the installation: Know your installation environment and familiarize yourself with the relevant ASTM standards for strength. A commercial floor subject to heavy wheel loads will require a higher-grade self-leveling underlayment (like Level Set® 300 Self-Leveling Underlayment) than a floor in a single-family home. Consult product data sheets for information on tensile strength, compressive strength and flexural strength. 2. Stabilize your substrate: Most products require that all surfaces are fully stable and structurally sound prior to the application of a self leveling underlayment. For example, wood must be securely fastened with screw type or ring shank nails and adhesive because if it shifts, it could cause cracking. 3. Prepare your substrate: Make sure to plug all floor openings, gaps and cracks and install termination dams to prevent any seepage with suitable products such as the TEC® Feather Edge Skim Coat. 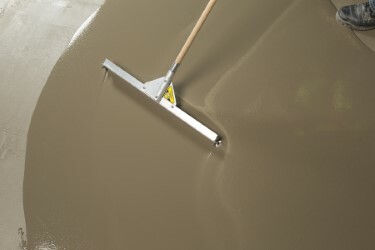 All self-leveling underlayments require the use of a primer prior to installation (like the TEC® Multipurpose Primer). See Primer label for application instructions. Beyond priming, most self-leveling underlayments require that the substrate is free from any contaminants that may inhibit bond, including oil, grease, dust, loose or peeling paint, sealers, floor finishes, curing compounds or contaminants. Make sure that this is the case before starting your installation. 4. Mix properly: Mix your self leveling underlayment to the consistency specified on the bag. Do not over mix it, as this can make it harder to work with and lead to cracking or improper flow. 5. Check the temperature and climate of the room: Make sure that the temperature of the room is within the manufacturer’s acceptable range. A climate that is too cold or too hot can cause issues. 6. Use as recommended: Manufacturers will specify the maximum thickness of their product. If a surface is extremely uneven in an isolated area, a patch (like the TEC® Floor Patch Pro) may be necessary, rather than a self leveling underlayment. A common theme connects these recommendations: noting and adhering to the manufacturer’s instructions. You must read labels and product data sheets carefully to ensure products perform as desired. Make sure to check out the expanded TEC® Surface Preparation line that builds upon the company’s leadership position in the grout and mortar product categories. Select a product appropriate for the installation: Know your installation environment and familiarize yourself with the relevant ASTM standards for strength. A commercial floor subject to heavy wheel loads will require a higher-grade self-leveling underlayment (like Level Set® 300 Self-Leveling Underlayment) than a floor in a single-family home. Consult product data sheets for information on tensile strength, compressive strength and flexural strength. Stabilize your substrate: Most products require that all surfaces are fully stable and structurally sound prior to the application of a self leveling underlayment. For example, wood must be securely fastened with screw type or ring shank nails and adhesive because if it shifts, it could cause cracking. Prepare your substrate: Make sure to plug all floor openings, gaps and cracks and install termination dams to prevent any seepage with suitable products such as the TEC® Feather Edge Skim Coat. All self-leveling underlayments require the use of a primer prior to installation (like the TEC® Multipurpose Primer). See Primer label for application instructions. Mix properly: Mix your self leveling underlayment to the consistency specified on the bag. Do not over mix it, as this can make it harder to work with and lead to cracking or improper flow. Check the temperature and climate of the room: Make sure that the temperature of the room is within the manufacturer’s acceptable range. A climate that is too cold or too hot can cause issues. Use as recommended: Manufacturers will specify the maximum thickness of their product. If a surface is extremely uneven in an isolated area, a patch (like the TEC® Floor Patch Pro) may be necessary, rather than a self leveling underlayment. ck out the expanded TEC® Surface Preparation line that builds upon the company’s leadership position in the grout and mortar product categories.